The Sauna Fix provides the most powerful and effective near infrared sauna therapy, but the sauna lamp works best when the proper type of red heat bulbs are installed. For optimum performance, we recommend using only red heat lamp bulbs with the Sauna Fix near infrared lamp, as the healing processes of the human body respond best to the wavelengths emitted by this type of sauna light bulb. Light wavelengths between the 630 nm and 900 nm range are categorized as the “healing” red to near infrared wavelength range that has been proven to stimulate the best biological response. Red incandescent heat lamp bulbs are the best choice for use in the Sauna Fix near infrared sauna lamp because they emit wavelengths of light within this therapeutic range. Just about any 250 Watt Red Heat Lamp Bulb will work. Eileen personally used the Philips 250-Watt Incandescent R40 Red Heat Lamp Bulb for years. Other than RubyLux and TheraBulb, the heat lamps emit some red light, near infrared, and mid infrared frequencies, giving a person multiple frequency exposure. Recently, a medical laser representative purchased the Sauna Fix and the Phillips brand bulbs and experienced detox symptoms and pain. 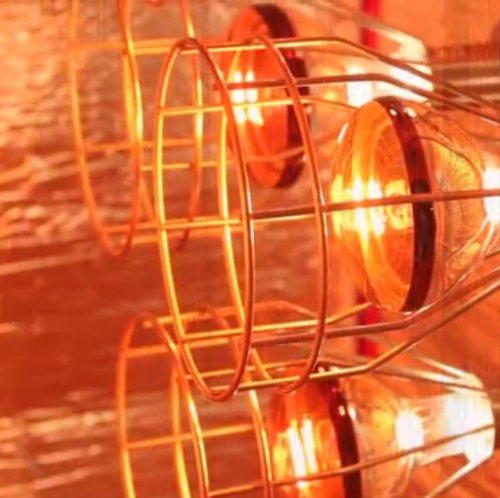 She reported that after researching all the red heat lamp bulbs, she purchased the TheraBulbs because they emitted only the therapeutically proven near infrared frequencies. After using the TheraBulbs, all of her detox symptoms and pain vanished and she felt a boost of energy. Her story was convincing, so Eileen purchased the TheraBulbs to try. After using the TheraBulbs for a few days, Eileen noticed she was heating up quicker and had a lot more energy. Previously she did not experience any detox symptoms or pain, but the improvement with TheraBulbs was significant enough where our top recommendation is to purchase the 250 Watt TheraBulbs directly from the manufacturer here: https://www.therabulb.com/discount/Wellness By using this link each bulb is discounted from $21.99 to $16.99 each, a savings of $5 per bulb. Please know that you must begin the checkout process for the discount to apply. Due to a recent discovery of a fourth phase of water, we only recommend using 2-3 of the Therabulbs, or 1-2 of the Phillips bulbs that produce 550-3400 nm. EZ water is a phase of water beyond solid, liquid, and vapor. It stores energy like a battery and grows when it absorbs infrared light, especially at 3,000 n m. Our skin acts as a solar panel to receive the light, and EZ water expands inside the body. Taking a heat lamp sauna increases hydration, as well as additional energy through hydroelectricity, due to how EZ water functions in the body. Below is a list of additional web stores where you can locate and purchase red heat lamp bulbs in the 250 watts required for the Sauna Fix NIR sauna lamp. Please note that we have not personally tested all of the bulbs listed, and do not have proof of their claims.